What fire safety precautions can I take to protect my home? 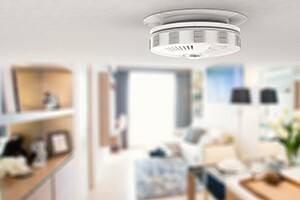 One of the most overlooked safety devices in your home is a smoke detector. There are basically two types of smoke detector systems, one that has smoke detector wiring that issues a signal to a monitored fire alarm system and the other, known as smoke alarms, generally, issue a local audible and/or visual alarm from the detector itself. Most smoke detectors work either by optical detection (photoelectric) or by physical process (ionization), while others use both detection methods to increase sensitivity to smoke. Smoke detector wiring can be powered by a central fire alarm system, which uses a battery backup. However, single-family detached and multi-family homes often use the type of smoke alarm powered by a single disposable battery. Most provincial and local laws regarding the required number and placement of smoke detectors are based upon standards established in the Canadian fire code. In Canada, it is required that a structure have a working smoke detector on every level. Minimum requirements are typically more stringent in new construction. All smoke detector wiring must be hooked directly to the electrical wiring system, be interconnected and have a battery backup. Some jurisdictions also require smoke detectors in stairways, main hallways and garages. Wired units allow a dozen or more detectors to be connected, so that if one detects smoke, the alarms will sound on all the detectors in the network, improving the chances that occupants will be alerted, even if they are behind closed doors or a few floors away from the alarms' location. Smoke detector wiring with interconnections may only be practical for use in new construction, especially if the wire needs to be routed in areas that are inaccessible without cutting open walls and ceilings. Most residential smoke detectors run on 9-volt alkaline or carbon-zinc batteries. When these batteries run down, the smoke detector becomes inactive. When the battery is low, most smoke detectors will signal with a chirping sound at regular intervals. In regions that observe daylight saving time, it is recommended that you replace the batteries in the smoke detector when the time on your clocks is updated. Contact a Direct Energy Home Services technician for assistance if you have questions or concerns about smoke detector placement, installation or repair. Local fire marshals and municipal building inspectors can also provide information on proper usage and placement.